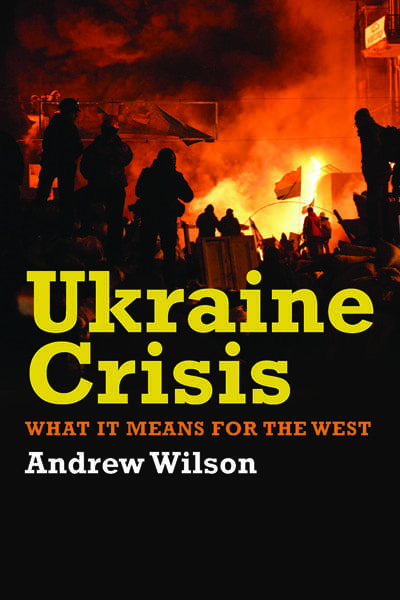 Andrew Wilson discusses his new book Ukraine Crisis: What it Means for The West with SSEES Research Blog. SRB: You made a trip to Ukraine when writing this book. Could you tell us about your experiences there? AW: When I was there, it struck me as a good idea that there was a book in all this. The previous time I was in Ukraine was in November last year, just before the protests started. But by February, it was also pretty clear that things were getting exciting and heading to some kind of denouement. So what do you do? You just go. I arrived in the middle of an old fashioned revolution. I remember a human chain collecting cobblestones. At the front you had young guys chucking them at the militia, but the human chain was made up of the entire citizenry of Kiev – well dressed women in high heels coming from the office, the grandmother at the front still holding her shopping in a blue plastic bag. It was like a nineteenth century revolution between the citizens and the evil rulers, a bit like Les Miserables. The book went to press really quickly, but hopefully, I can put some pictures in the second edition. SRB: You refer to the Orange Revolution as a precedent to the Ukraine crisis. To what extent do you see this crisis is a continuation of the 2004 Orange Revolution? AW: Well, the protesters clearly had that in mind. Initially they were copying the tactics of the Orange Revolution and it started in the same way – a peaceful, carnival-like protest. But people were also thinking of how to do it better. It was clear very early on during the Orange Revolution in 2004 that the regime wasn’t capable of using violence, whereas this time the regime did use violence–but did so very early and not sufficiently to put an end to things. So had a very early set of calculations with how to deal with a very different regime. Ultimately the tragedy is that immediately after the uprising there was a sense of optimism that Ukraine was doing better this time but it never got the chance to show that because people were still learning lessons from the disappointments that followed the Orange Revolution. SRB: Do you think in the immediate future that the Russia’s hegemony will dictate the political paths of countries in Eastern Europe? AW: We can see Russia trying to influence all its neighbours, not just Ukraine. The bigger picture is a pretty scary one. If it is true that the countries that reformed fairly successfully in the 1990s in Central Europe were able to do so only because Russia was not really able prevent them, whereas Russia is now so able to do so here –that’s a pretty depressing conclusion. It’s not just Ukraine but other countries that might be unable to reform or undertake the EU-friendly policies that Brussels wants; Moldova is a big test case with the election coming up, Georgia is a very interesting case too, because it has already reformed but under Russian pressure is now backsliding a bit. We can also see the reintroduction of a more Russian political culture – back to corruption, patronage, political prosecutions. The Baltic States are an important test case too because they’re in EU and NATO, but will that protect them from Russian pressure? What’s more, this is clearly not just about Ukraine but about Russia’s ambitions in the whole neighbourhood. Long- term I think Russia is over extended, so it would be able make trouble everywhere, but it can probably make trouble in two countries at once. SRB: You talked about the Ukrainian ‘crisis’ – can you say something about this label as opposed to concepts such as revolution and reform? AW: A lot of people in Ukraine don’t like the label – and for two reasons. First, it assumes there is a crisis. It doesn’t frame events positively. When they talk about the uprising, the Ukrainians speak about the revolution of dignity – that’s their label. Obviously the term crisis phrases this in more negative terms. Secondly, Ukraine didn’t cause the crisis. Russia did because of the events in Crimea and the trouble in East Ukraine. There is a broader sense in which Russia’s challenge to the entire post-Cold War order is, in fact, the bigger crisis and that Ukraine is only part of. I accept all that but I am also compromising with my publishers who wanted to use the more well-known phraseology. SRB: What do you think this conflict, or crisis, means for the West and how does that affect East-West relations? AW: Clearly, Russia is doing what it’s doing because it thinks we’re weak and divided, slow to react. We haven’t entirely been slow. By hook or by crook, we’ve got to roughly the right position on sanctions – whether we would have done so without the MH17 tragedy we don’t know, though to be fair America had announced the same sanctions the day before. We are now in a position where sanctions are doing a lot of damage to the Russian economy. But more broadly, Russia thinks it can play at divide-and-rule, thinks our attention span is limited and that we’re already fleeting on to the next crisis in Syria, Iraq and elsewhere. That’s true, and in this sense we have an attention deficit disorder and Russia can stay more focused and exploit that. The crisis has also shown how Russian channels of influence-pedalling extend beyond the former USSR; how Russia operates through propaganda in Europe; how it exploits certain anti-systemic forces and political parties. This is not always the case though. It was really interesting to read Russia’s commentary on the Scottish referendum. They simply couldn’t understand that a) it was really democratic and b) that the separatists didn’t win. They are locked into this expectation that Europe is collapsing and corrupt. So it had to be a fix, according to Russia. Obviously, it wasn’t. This a real challenge to the West in terms of devising an effective policy response. Sanctions have roughly got to the right place, though I don’t think Germany has played a very good role, pushing for a bad peace. Germans don’t understand Putin’s modus operandi. The Germans pushed Ukraine into this stupid compromise of delaying the EU Association Agreement and Putin just tried to renegotiate the whole agreement. So there are people in Europe who don’t understand how Russia works. And for America there are big challenges about how far it can retreat from its traditional global policeman role. If troubles just flare up in the areas they pay less attention to, there’s no net gain. When they come back they have to work even harder to stabilize things. So America has been playing less attention to Eastern Europe. How much more it will now pay is a test of America’s smart power. America really believes that financial sanctions can do the traditional work of armies and drones. We’ll see. SRB: Thinking of Ukraine’s struggle over aligning itself either with the EU or Russia, how do you see the future of civil society and the mass-media? What possible economic and political scenarios do you envisage?
. But it’s also because public opinion in the rest of eastern and southern Ukraine has shifted – it’s more united , it blames Russia , it supports a tough response and, temporarily at least, opinion has shifted in favour of the European Union. But we don’t know how long this will last, particularly if the EU does not deliver and open its doors to Ukraine. With regards the reshaping of civil society and the mass-media, that was part of the wave of optimism of February. Civil society in Ukraine is much, much stronger than it was back in 2004. I was talking to an Open Society guy from Kiev and he put the difference in really personal terms: ‘In 2004, I knew everybody. All civic activists could fit in the same restaurant…if it was big enough.’ Now it’s a lot bigger and more differentiated, it doesn’t include just traditional NGOs – you’ve got civic activists, new media start-ups, really good new channels like Hromadske TV and Espresso. You got people doing really good stuff online, investigating the corruption of the Yanukovich regime and so on. Although civil society hasn’t quite worked out its relationship with government, civil society didn’t really trust government –which is fair enough. But there is a sense that it’s slightly spurious criticizing government from outside and not doing the work of government themselves – though some are standing for elections on 26 October. The mass media is freer than it was in the sense that state censorship is gone and there is greater pluralism than before, though the main TV channels still have oligarchical owners. So all of that would form grounds for relative optimism compared to 2004, if Russia was not a factor standing in the way trying to spoil all that. Though even without Russia it was pretty clear that the Leviathan of the post-Soviet Ukrainian state was always going to be really different from before, very difficult to reform; some of the revelations about how corrupt things were everywhere, in every sphere of life under Yanukovich are hugely depressing. At the moment Ukraine hasn’t really started reform. The hope is that it may start doing so more actively after the upcoming elections. War and economic collapse may trump everything. SRB: You’ve published extensively on Ukraine. How does this new book fit in with your previous work? AW: I wrote three books on Ukraine in the 1990s: Ukraine: Perestroika to Independence (with Taras Kuzio), Ukrainian Nationalism in the 1990s: A Minority Faith, The Ukrainians: Unexpected Nation . In them you can find what became the standard picture: that Ukraine was not a united nation when it became independent. Whether its internal fault lines would be fatal was a big question, but they were certainly there. Ukraine didn’t fall apart in the early 1990s when it collapsed economically. Ukraine didn’t tear itself apart in 2004 when it had the Orange Revolution. Ukraine didn’t fall apart in the last days of Yushchenko’s presidency – and he was more nationalist than anything we’d seen in 2014. Those three books set out the latent tensions within Ukraine’s society but didn’t predict that Ukraine would fall apart – it’s taken external intervention to push Ukraine in that direction. Then my book Virtual Politics: Faking Democracy in the Post-Soviet World came out in 2005. And that was quite prescient, it described the pathologies that were developing in Russia and the highly manipulative modus operandi in ‘politics and foreign policy which has only got worse and spread into other areas, so called ‘political technology; the hybrid of war and information war that we see now are all types of ‘political technology really’. Not unexpectedly, in the ten years since the book came out many of these pathologies have only got worse. Russia is a pathological state, not just because it’s aggressive and corrupt but because its modus operandi is deeply corrosive both of both its politics and those of other peoples. SRB: Do you think the upcoming parliamentary elections in Ukraine will bring positive change? AW: The bad news is that the elections are going to be held under the old guard – there was a certain amount of speculation in the summer about how Ukraine couldn’t possibly change things. That’s nonsense. They could change things in five minutes if they wanted to. The problem here is that you have 450 MPs, half of whom are going to be elected in single mandate constituencies which is where the old guard can buy victory. If Ukraine had gone for a fully PR system, then the old guard would have been squeezed out to a much greater extent. So an awful lot of people who in a different country would probably be swinging from a lam post – some of them with blood on their hands – are going to become MPs again, which is quite depressing. There’s also a 5% barrier for representation, which makes it more difficult for new parties to launch. 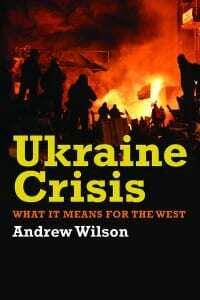 Andrew Wilson is Reader in Ukrainian Studies at UCL-SSEES. He was interviewed for SSEES Research Blog by Roxana Bratu and Flavia Munteanu. The cover illustration is reproduced by kind permission of Yale University Press.